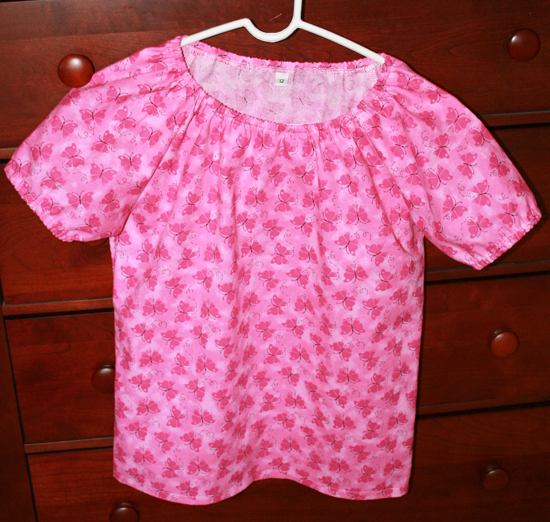 Kwik Sew 3169 – Sewing Up A Cute Peasant Top! My growing like a weed daughter picked out some fabric the other day and I have been trying to find the “right” pattern for it. Today I sewed up Kwik Sew 3169 in a test fabric. It is a peasant top pattern with the option for short or long sleeves. Like the pattern, the test fabric has been marinating in my stash for some time. It is from the Charms line by Patty Reed Design, produced by Fabric Traditions. 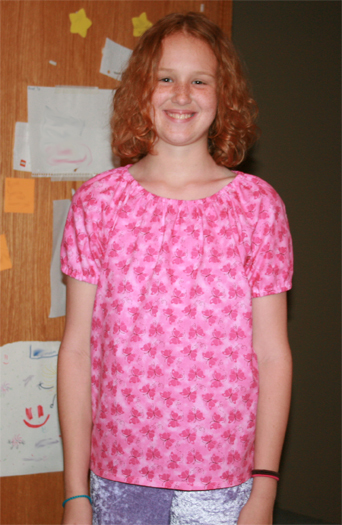 As an indication of how long I have been holding onto it, the copyright on it says 2006 and I am fairly certain I made Zoe a sundress from it years ago. When I pulled it out for this top, I expected to be vetoed. (It wasn’t!) Now that she’s ten, most of the cute fabrics get an eye roll. Zoe is tall and needs extra length on most tops. I added 2″ to the length of the body on this one and only did a half inch hem. This is size XL(12-14). She likes it, but says the area under the arms is scratchy. I expect that a run through the wash will likely take care of that problem. 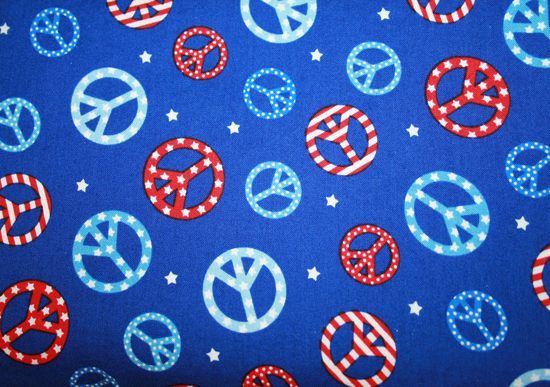 Unfortunately, this will not be the pattern for her peace sign fabric. Now she is thinking maybe a skirt. Sigh. Back to search my pattern files. Kansas City Star Quilts had so many wonderful things to see in their booth, I wish I had taken more photos. These applique quilt designs are from a book called Robots in Space! by Linda Frost. Check out the cute stuffed robots, too! Here’s Alphabet Zoo by Vicki Hansen. In another part of their exhibit, they had a bunch of mini quilts and these large quilts with SO many little pieces! I can only imagine all the time spent piecing them! The large quilt in the center is from Bonnie K. Hunter’s book – MORE Adventures With Leaders and Enders. The one next to it may be as well; if anyone knows, please let me know! update! Both of these quilts are Bonnie’s. So much lovely work there! And oh, the mini quilts! Here are just a few. 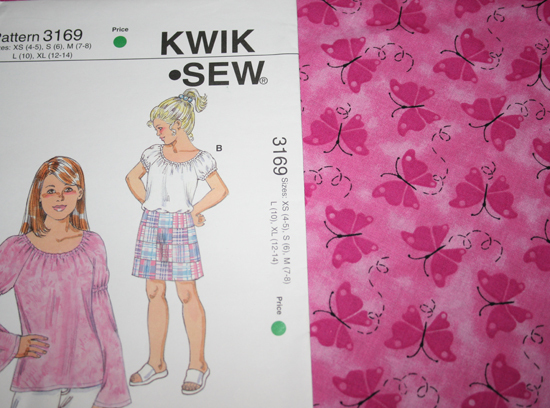 When I need a good basic pattern, Kwik Sew patterns are my go-to patterns. 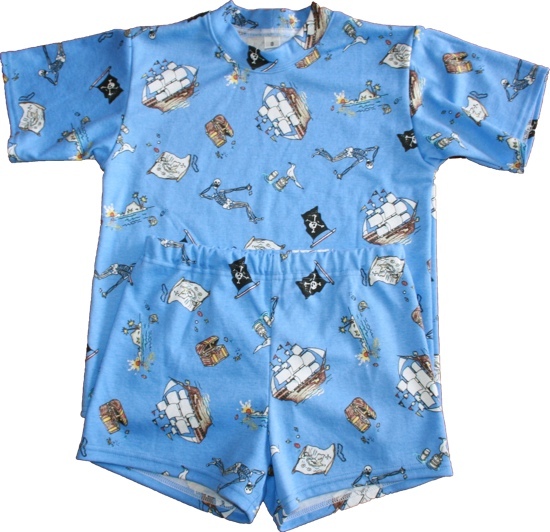 Kwik Sew 2302 is for boys’ pajamas. The top I made is a hybrid of the two views – neckline from view A, sleeves from view B. The shorts are view B.
I made these in size 8 with no major modifications. The only change was the use of 1″ non-roll elastic rather than 3/8″ and I used more than the 20″ called for. I do not typically measure elastic, I just put it around the kid I am sewing for and then cut it while it is around the waist. These went together quickly and fit well. Now that the test pair has received the 8 year old’s stamp of approval, I can make more. I still need to make summer jammies for the girl, too. Do you have a tried-and-true pj pattern? This issue begins with cute things for little girls. Comfortable jersey capris are paired with a tank and sweater. The capris are also cute under the light cotton skirt, creating a fun spring look while the days are still cool. If you need something snazzy for your little boy, this pair of dress pants and buttoned shirt should fit the bill. He’ll be the most dapper young man at any Spring event. There are plenty of details in the overalls in this issue. We do not wear a lot of long pants here most summers, but these could easily be made as shorts. Sew them up in a pink or purple twill rather than dark denim or swap the white topstitching thread with a variegated pink swirl and this pattern will work for the most girly girl as well. 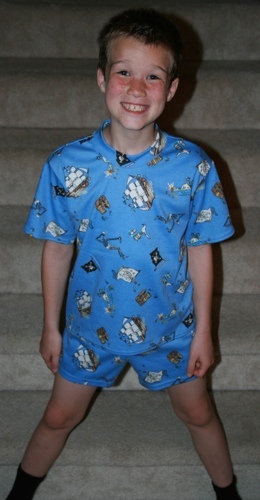 Sized from 92-140, these sporty shorts are sure to be a popular choice for kids on the go this summer. The raglan sleeve hoodie in this issue is a great layering option to take the kids from spring days through cool summer camping at the beach. In the lower size ranges, there is a cute tank style tunic with little cap sleeves, pants, two rompers, a tank style body suit, two t-shirts and adorable overalls. Girls also get a knit tank with tied shoulder straps and a sweet woven top with a gathered neckline. There is also a woven dress with a sweet simplicity that makes it look good without being too fussy. Older boys get a sleeveless hoodie with a zipper and cropped pants with plenty of pockets. There is also a comfortable knit top with collar. The short sleeve button down shirt can pass for dressy or casual, so it looks like all the kids will be ready for the season’s special events, from graduations to weddings and more! Here is the distribution of sizes in the Summer 2014 issue of Ottobre. First, there are 40 designs in this issue. They are available in the following sizes. 1) If there is a range of sizes, the corresponding number of designs is for each size. So, for 50-56, there are four designs for girls in size 50 and 4 in size 56. 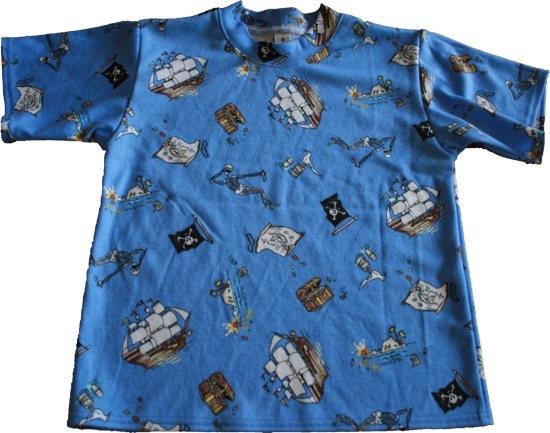 In that size, there happen to also be four designs for boys in both sizes. There are also 4 total designs in each size, which means all 4 are gender neutral. 2) There are always more designs for girls than boys, simply because it is easier to take a design shown for boys and use it for girls by adding more typically feminine features or using fabrics that appeal to girls. It is pretty difficult to take a girl’s dress and make it work for a boy! 3) Three of the forty designs in this issue are hats, either brimmed or beanie style and suitable for either boys or girls. Since the hats are sized by head circumference, they have been excluded from the chart.